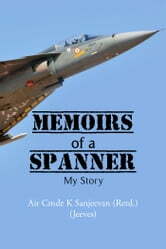 This book is about the experiences of an eighty-four-year-old retired officer of the Indian Air Force. He joined the Royal Indian Air Force in 1949 and retired as an Air Commodore from the Indian Air Force in 1986. The book includes his life as an enlisted airman, his experiences as a qualified engineering officer in helicopter, transport and fighter squadrons, his training at the Defence Services Staff College, Wellington, and subsequent staff appointments, and about his tenure as a military diplomat at the Indian Embassy in Moscow and appointment as the commanding officer of an Air Force Station. Details of his life as an executive in DaimlerBenz Aerospace for a decade after retirement are also mentioned in the narrative.